Our first purchase on a now-Philippine enabled Android Marketplace was Death Worm by PlayCreek. Back then, there was a dearth of choices, since most publishers haven’t yet enabled their games to be purchased in the Philippines – despite Google’s unlocking of the country for transactions. Two weeks later, we notice that we could purchase a lot more on the marketplace – giving us some possible extra choice in the matter for our next app. But was our first Android purchase worth it, given the price of $2.99 (PHP130.00) over the rest of the Android marketplace? Here’s a review of Death Worm (for iOS & Android) to find out. 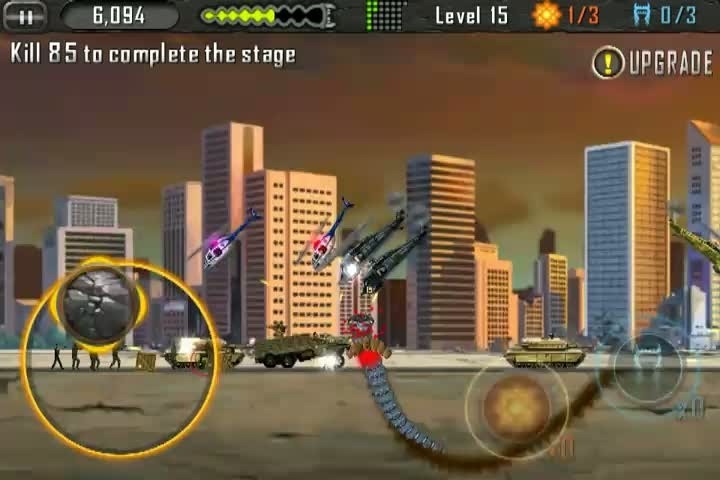 Death Worm is an action game where you play as a man-eating giant worm that burrows and pops off the ground to eat and destroy animals, humans, cars, helicopters, airplanes, and even the occasional alien spacecraft. 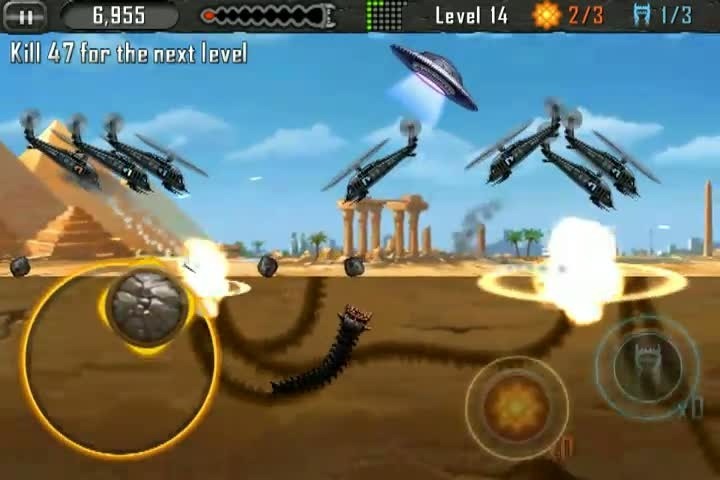 The gameplay is 2D and you control the worm using an analog directional touch pad on either the left side or right side of the screen. Powerups are available like a nitro that speeds up the worm for a certain time or fireballs for extra carnage. Every level you complete gives you an upgrade choice – size, speed, skin strength, nitro duration, and fireball power. Unfortunately, the game doesn’t last very long. There are only three game modes to choose from – Survival, Campaign and Mini Game. Survival is basically going through an endless level trying to stay alive and getting a high score. In this mode, eating humans give back health and every score milestone gives you an upgrade. Campaign mode gives you three maximum stages to choose from and 15 “levels”. Realistically, its just three areas with 15 milestones to reach. It won’t take 20 minutes to finish a stage and you only have 3 stages to choose from. Finally, there’s Mini Game mode, which only features two mini games. One where you try to stay alive while moving forward jumping, and the other where you try to attack helicopters by bumping crates onto them. If these sound repetitive, that’s because they are. Supposedly, the game has extra stages and mini games with “Coming Soon” placeholders, but we’d rather not guess when they’ll arrive. Graphics and sound are pretty adequate. The game runs at high resolution and the frame rate is solid throughout on our HTC Desire. The music is synthesized rock guitar which isn’t terrible. Leaderboards are implemented but only the iOS version has GameCenter support and online leaderboards. The Android version only keeps local high scores – so you’re only really playing against your own. At $2.99 for Android, it’s a little hard to recommend Death Worm over the massive amounts of free and $0.99 games out there – especially ones with much longer playtimes and/or replayability than this game. It provides a slightly better value on iOS for $0.99 and has GameCenter support, but you’re still competing with a ton of games which provide much more value than this one.